When the Hillgrove Hawks and Walton Raiders meet in the Battle of the Big Chicken, they’ll be making history in the second annual showcase. It is surprising that these two perennial winners have never faced each other despite being just 13 miles and a couple turns off Roswell Road from each other. With each school’s rich playoff history, you could easily have expected the teams to have met in the postseason. Hillgrove began playing football in 2006 and has been in the playoffs four of the last five years. Walton has been in the playoffs every year but one since 2002 (2009). The Hawks reached the state quarterfinals in 2010. Walton reached the state championship game in 2011. Hillgrove cruised through its opening game last week, a 26-6 home victory over Westlake. Quarterbacking the offense is head coach Phillip Ironside’s son, Elijah. A back-up while recovering from an injury last year, Elijah operates a spread offense for the Hawks that features a lot of depth at wide receiver. Justin Denton appears to be the playmaker of the group. Denton scored on three passes from Ironside in the first half of the opener. Denton is joined on the outside by Omar Black and Zach Katz. Running back Richardre Bagley, also recovering from an injury last year, seems set to pace the running game. He was the leading rusher against Westlake with 84 yards. The Hawks’ defense is led by defensive end/linebacker Bradley Chubb, an N.C. State commit. In the opener, the defense held Westlake scoreless. (The Lions’ only score came on a fumble recovery returned for a touchdown). Walton had a tougher first week. 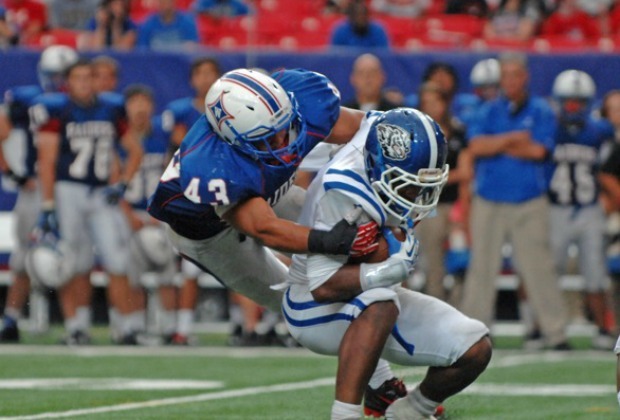 The Raiders fell to Peachtree Ridge 23-17 in the Metro PCS Corky Kell Classic at the Georgia Dome. Head coach Rocky Hidalgo is turning his offense over to first-year starter Price Wilson. (Wilson did fill in as a starter in four games last year, winning three). In the Raiders’ opener Wilson threw for two touch- downs in the first quarter against the Lions, one each to Maurice Gibson and Jordan McCray. Wilson, a Louisiana Tech commitment, is working behind a talented, but young, offensive line. Sophomore K.K. Brooks looks to be a workhorse in the backfield. The first-time varsity starter led the Raiders with 120 yards on 22 carries at the Dome. On defense, Walton also possesses a combination of youth and talent. The strength of the team may be the safeties. D.J. Smith returns as a starter and is joined by converted cornerback Taquar Stewart. The Raiders’ linebacking corps flashes some speed with the Williams boys, Dreyon and Zach, both seniors who are of no relation.